The Hiram Bearss mug is part of a biographical series profiling unique individuals and includes an image of Hiram Bearss and a short biography. This James Burt mug is part of our collection of Medal of Honor biographical mugs. An image of James Burt and a short biography are features of this history mug. 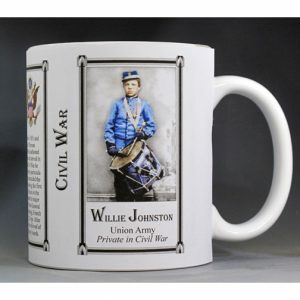 This George Musalas Colvocoresses mug is part of our collection of Civil War biographical mugs. An image of George Musalas Colvocoresses and a short biography are features of this history mug. 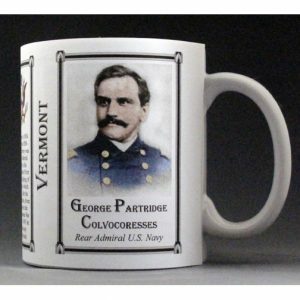 The George Partridge Colvocoresses mug is part of a biographical series profiling unique individuals and includes an image of George Partridge Colvocoresses and a short biography. 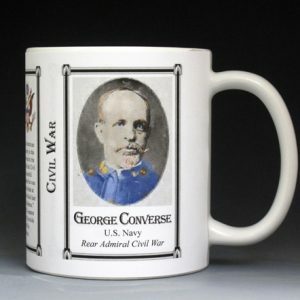 This George Converse mug is part of our collection of Civil War biographical mugs. An image of George Converse and a short biography are features of this history mug. 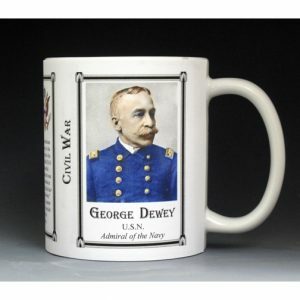 This George Dewey mug is part of our collection of Civil War biographical mugs. An image of George Dewey and a short biography are features of this history mug. The George Dewey mug is part of a biographical series profiling unique individuals who shaped the history of Vermont. An image of George Dewey and a short biography are features of this history mug. This Grenville Dodge mug is part of our collection of Civil War biographical mugs. An image of Grenville Dodge and a short biography are features of this history mug. 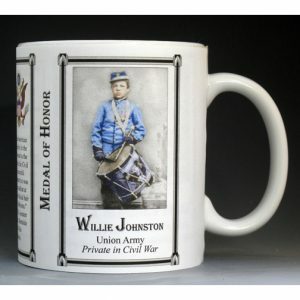 The Willie Johnston mug is part of a biographical series profiling unique individuals and includes an image of Willie Johnston and a short biography. This Frederick Lander mug is part of our collection of Civil War biographical mugs. An image of Frederick Lander and a short biography are features of this history mug. This Robert Milroy mug is part of our collection of Civil War biographical mugs. An image of Robert Milroy and a short biography are features of this history mug. 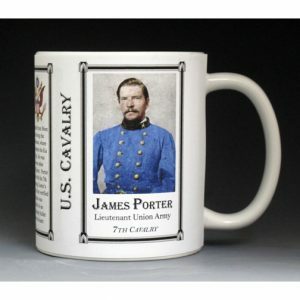 The James Porter mug is part of a biographical series profiling unique individuals and includes an image of James Porter and a short biography. This Thomas Ransom mug is part of our collection of Civil War biographical mugs. An image of Thomas Ransom and a short biography are features of this history mug. 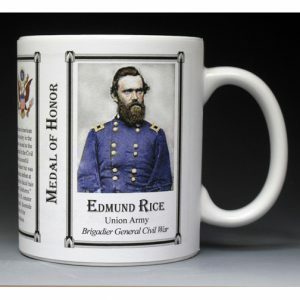 This Edmund Rice mug is part of our collection of Civil War biographical mugs. An image of Edmund Rice and a short biography are features of this history mug. 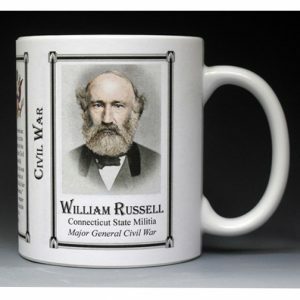 This William Russell mug is part of our collection of Civil War biographical mugs. An image of William Russell and a short biography are features of this history mug. 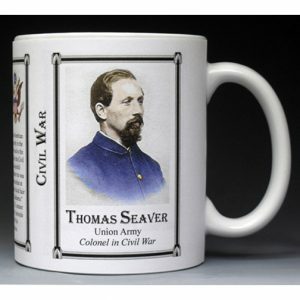 This Thomas Seaver mug is part of our collection of Civil War biographical mugs. An image of Thomas Seaver and a short biography are features of this history mug. 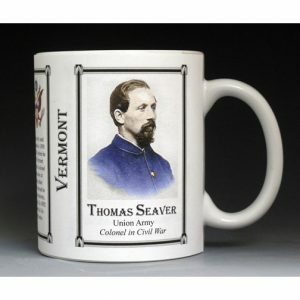 The Thomas Seaver mug is part of a biographical series profiling unique individuals who shaped the history of Vermont. An image of Thomas Seaver and a short biography are features of this history mug. 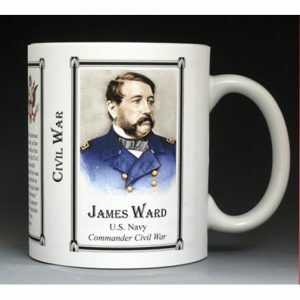 This James Ward mug is part of our collection of Civil War biographical mugs. An image of James Ward and a short biography are features of this history mug. This Gideon Welles mug is part of our collection of Civil War biographical mugs. An image of Gideon Welles and a short biography are features of this history mug. 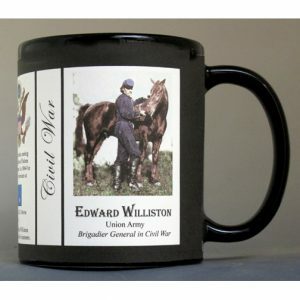 This Edward Williston mug is part of our collection of Civil War biographical mugs. 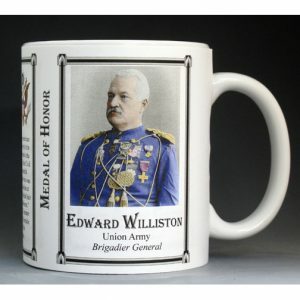 An image of Edward Williston and a short biography are features of this history mug. The Edward Williston mug is part of a biographical series profiling unique individuals who shaped the history of Vermont. 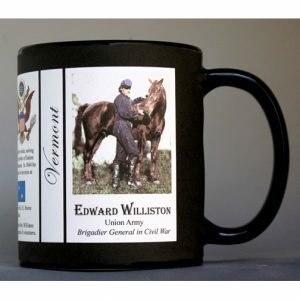 An image of Edward Williston and a short biography are features of this history mug. This Henry Clay Wood mug is part of our collection of Civil War biographical mugs. 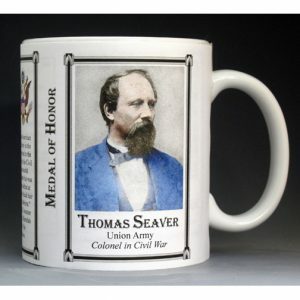 An image of Henry Clay Wood and a short biography are features of this history mug.